You get new glasses, either your first pair or the latest in a long run of stronger glasses, and your vision is distorted. Why? The short answer is your brain hasn’t adjusted to them. When you’re nearsighted, one way your brain learns to judge distance is by how relatively blurry an object is. This can be true either without glasses or with your old weaker glasses that you don’t see sharply through. When you put stronger glasses on that sharpen up your vision to 20/20 or better, suddenly your brain is telling you everything is closer than it should be. You see the details of the rocks on the ground and the blades of grass, and you feel shorter, like you’re right down there in it. 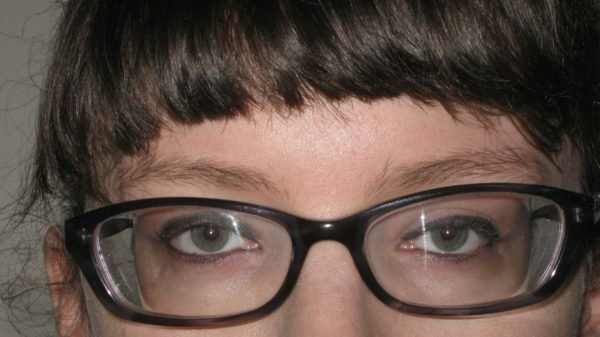 At the same time, stronger glasses (or your first pair of glasses) cause everything to look smaller. This is because of the distance they sit from your eyes. Contact lenses don’t create this effect. Have you noticed when a nearsighted person wears strong glasses, the sides of their head through the lenses don’t line up with their head outside them? See an example below. The light is bent, and their eyes appear smaller, along with the rest of their face through the lenses. A similar thing is going on from the other direction. So on one hand the glasses make you feel like objects are closer, and at the same time they look smaller. It’s disorienting. You might notice other effects too. Objects might seem like they’re curved, or the top is farther away than the bottom. Any number of things. Your visual system is being forced to re-calibrate itself to perceive the world through these weird things you have on your face that it wasn’t made to see through all the time. You can be getting a headache from your new glasses no matter if they are prescribed “correctly” or not. Some eye doctors will insist that this means there must be an mistake with the prescription, especially if it was some other eye doctor who prescribed it, or there must be some other vision problem that wasn’t addressed. The rationale is that glasses make things better and that certainly glasses would never be causing these headaches. Most headaches like these are tension headaches. The pain is caused by muscle contractions in the head and neck regions. A feeling of tightness around the eyes, or within the eyes, is evidence of this, not to mention a stiff neck or a need to massage your temples. Why would glasses be causing this? It has to do with the way you use your eyes. There are bad habits that cause chronic tension as you struggle to do something that your body or brain was not designed to do. This is part of what this website is all about. The headaches might be related to dizziness. Glasses can make you both dizzy and nauseous. All this stuff can be related. Again it’s a perceptual change that your brain doesn’t know how to react to. The placement of objects, movement, and depth perception has all changed, and your brain doesn’t know how to process it yet to reorient your sense of balance, so you feel dizzy. It should be noted that dizziness and other problems can also come from bad prescriptions or low quality lens materials. In a 2014 study, 45% of glasses ordered online had incorrect prescriptions. Within a couple weeks you get used to it. Your visual system is amazingly resilient, and it will learn to perceive in new environments quickly. Or usually that’s the case. Some people never really adapt to the glasses, go see the eye doctor again and again, and come away disappointed. If you have a hard time getting used to new glasses, maybe your brain is trying to tell you something. Glasses are not good for your vision. Most people who start to wear glasses have to get only stronger glasses over the years. There are some exceptions, but that’s the usual course. It’s unfortunate, because it isn’t necessary. If you run this by your friend who also wears glasses, he will be quick to reassure you that you just need to get used to the stronger glasses. It’s like how drunks don’t want to drink alone. They don’t realize it, but deep inside they feel bad about their drinking habit, but if someone else shares it with them they feel less bad. 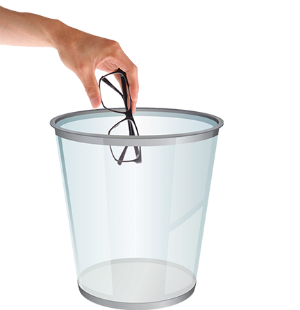 Have you ever thought about how you might wean yourself away from glasses for good, and see clearly naturally? Mention this to someone who wears glasses and you’ll most likely get ridiculed and told how there is absolutely no way to reverse nearsightedness other than surgery. But voice your intent to someone who doesn’t wear glasses and you’ll probably get encouragement. Interesting how that works, isn’t it? They aren’t emotionally invested in their condition. As I said, your visual system is resilient. No matter how nearsighted you are, you can improve your vision and ditch those glasses for good. 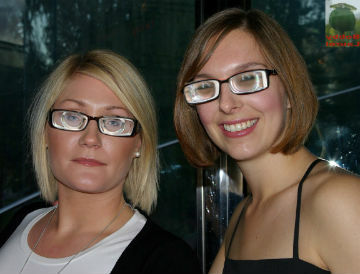 See my article The Problem With Glasses. You have plenty of reasons to get out of your glasses. They’re annoying, uncomfortable, restrict what you can do, and what’s more, they make your vision more blurry without them, and you depend on them more and more for everyday tasks. Although your eyes can adapt to glasses, it doesn’t mean they like it. Eyestrain is extremely common among people who are nearsighted. Glasses discourage some aspects of normal vision, like peripheral vision awareness and free movement of the eyes, that are necessary for the visual system to fully and efficiently process the visual world around you. When your visual system isn’t able to do that, your vision will suffer. Your eyes won’t focus right. You’ll develop other problems. So think about going back to your old glasses. Were they so bad? Going back to them may help stop your vision from getting worse. The next step is learning to see without them too. Been wearing glasses for 60 years – nearsighted and astigmatism. Some people are very sensitive to the material being used, and to how well the lenses are ground along the base curve. If you are dizzy and sick after one day – forget it. Find an expert who uses a good lab. Check the lens material. Polycarbonate lenses caused chromatic aberration for me and other problems. Also having problems with Trivex – maybe depth of field – makes for awful dizziness and nausea. Trust your own instincts. If the glasses are causing problems, ask for a redo. About 30 years ago I had 5 redos before someone figured out that the lenses had to be ground along the base curve. As soon as they did that – All was fine, had immediate good adjustment. Ginnie your eyesight condition a requires a full response. you may have to wait a couple of days. I trust your eye doctor has suggested some approach options. and your are reviewing your options to return emotional balance in the face of an uncertain future. Astigmatism is a cause in lack of perfect corneal symmetry. the Method . Your condition Map dot dystrophy is weakening the cornea. the non conventional approach herbalist base and tangible healing forces. need to get into gear to manage a potential critical condition . supplementation is not regarded as an answer to the average physician. there is an untapped healing source in everyone’s hands the method employs this in palming . Lie down with a pillow on your chest and palm and [get creative put on your top ten favourite music pieces for 30 minutes or more] Take stock of what is happening in your life review worst case scenarios and also the journey into possibilities of curing your condition from my your mind and soul set. thank you for the courage to share with others your condition. Best wishes. Man, I just get hella dizzy and everything seems so distant. It gave me a headache and I’d only been walking with them on for 1-2 minutes. Is this your first pair of glasses? 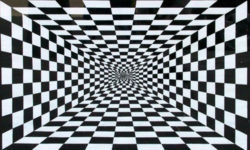 David, great blog on bad depth and dizziness. Opening gambit a [first caring question] for those who wear glasses. How long have you needed to wear glasses? Have you a blog on perception of blur left and right eye/brain mindsets? Bates suggested that ability to make your vision worse is a start of awareness to practice vision fusion games and notice improvement with the desirable outcome of improved combined eye fusion and stereoscopic vision. The journey shows up the two-ness as you swiftly shift detailed distance focus near and far. Previous Previous post: Do You Believe You Can See Clearly? Next Next post: Where Is Your Attention?